While my wife and I were packing up our home to move out this past Wednesday, we received some disheartening news. Our merger with Del Aire Baptist Church would no longer be pursued, and we were in need of making some different arrangements for Stone Table Church. Our present plans are to pursue the open door we have in front of us; which is to meet this upcoming sunday for worship at a local park. We cherish the seven months we were given the grace of worshipping Jesus with the people of Del Aire. A highlight for me was seeing the response to the gospel on Easter Sunday; that lives were changed and a people gathered in the small chapel on 119th Place. The service reached it’s pinnacle when Hannah belted out ‘Because He lives’; and God’s people being moved by the death, and resurrection of Jesus Christ on our behalf. We have been welcomed, and embraced by the people of Del Aire through and through with hearts wide open to our young families, and with generous acceptance of our team in the welcome of the gospel. During our time worshipping and serving together, we saw that reconciliation between different peoples was a reality in the beauty of the gospel. As we leave this season, we will continue as a multicultural, multigenerational, multiethnic expression of the gospel. We learned so much in the grace of God towards flexibility, and what it means to be a people who bend, give, and defer in the gospel. We truly believe that in the gospel there are no irreconcilable differences; and what we saw, in and especially amongst the millennials, was not only an acceptance of multicultural worship and church life, but an expectation and hunger for it. It’s a beautiful thing to see millennials pursuing the kind of unity that must mark the church in the future, to be the most unified place our divided land sees (John 17:20-23). To be clear, we saw many levels of what was possible, and we consider it worth fighting for moving forward; and believe this effort and endeavor is a part of the gospel worth pursuing. In the theology of the cross, sometimes a “failure” is a success in the risk that the gospel calls us to. In God’s economy, “Love is not a victory march, but a cold and broken hallelujah” (to quote Leonard Cohen’s Hallelujah). There is often a death before a resurrection, and we don’t count the attempt to be a failure, nor do we regret the relationship, or the attempt to do something not often done; in fact we believe that God calls us to these kinds of endeavors. We thank God for Pastor John Jefferson, and the people of Del Aire Baptist Church. We thank God for the grace across these seven months to pursue a plurality of leadership, gospel reconciliation, ministry, and social justice in the gospel of Jesus Christ. 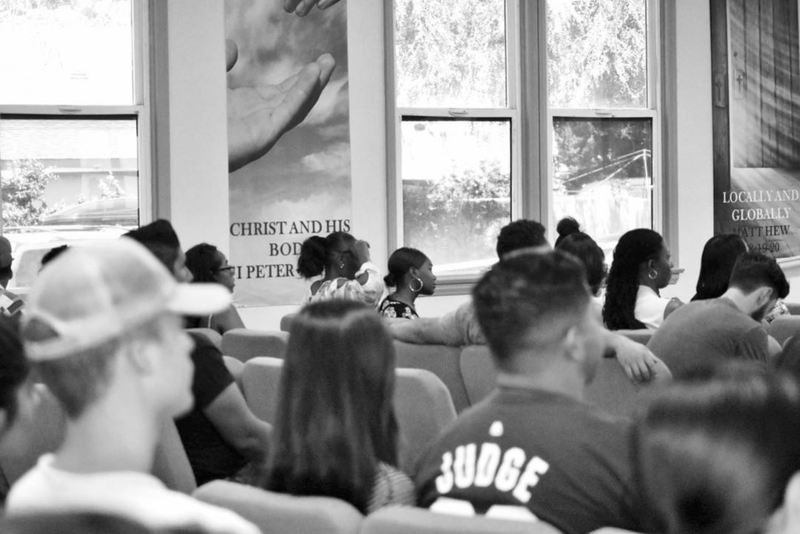 We believe wholeheartedly in the gospel’s expression on the block in Hawthorne. I thank God for great moments with the people. I thank God for the new friendships we made and am praying that the door would remain open to continue cultivating these relationships. It truly is a beautiful people that God cultivated within our midst at the Church at Del Aire during our time there. I am grateful for the lessons learned following Pastor Jefferson through the city, and into places of meeting with people both in poverty, and vulnerability, and not only coming to their aid, but also equipping and empowering them with their own value and worth in the gospel. This sunday we will worship, and then picnic outside on the lawn, and the following Sunday we will meet inside the George E. Gordon Clubhouse for service (we invite you to bring your families, picnic, and lawn chairs!). In addition we plan on having some fun afterward at Recreation Park (Let us know if you don’t have a lawn chair, as we will have extras available for you!). This park offers our families the opportunity to both enjoy a worship service, and also enjoy a time of fun, fellowship and family building afterwards. This will be our home for the fall, unless the LORD change the plan. We anticipate fellowship following sunday services, beach days, bonfires, mission, and fun. For ministry partners, churches, and friends... those generously committed to this work, we are in prayerful pursuit of some financial needs and a list of items needed for doing church in a portable way for this season in the life of the church. If you have resources you are willing to part with, we are in need of putting them to use to make this portable church work. The Clubhouse is a great location, but it is also incumbent upon us to do some work to make it a special place to fellowship each week. If you have people, resources, or materials you are able to send our way, this is the season where we need it to restart. I thank you for your generosity for where we have been, and believe that God has abundant grace through you, and many others that he is paving our path, and supporting our steps it’s in the future. Our greatest need, and our greatest request from you is that you be generous in prayer. We believe that the LORD will rebuild us as a church as we relaunch The Table.